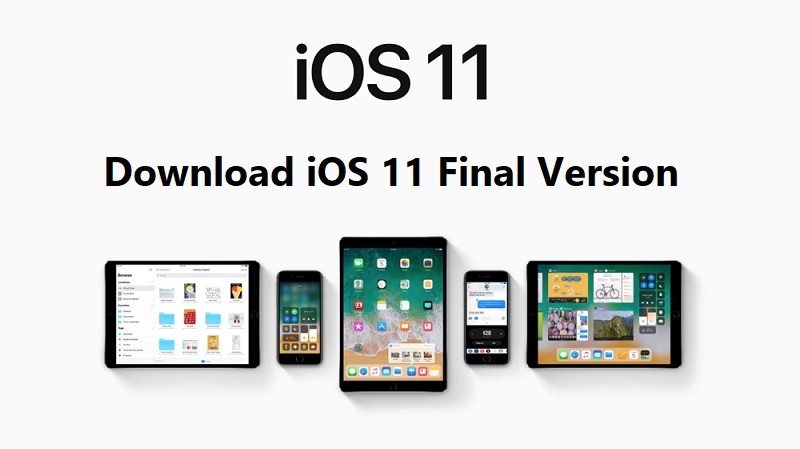 After testing several iOS 11 Firmware Beta Builds, now finally Apple has released the much-awaited official iOS 11 Final Version with the announcement of iPhone 8 / iPhone 8 Plus / iPhone X at the special event this past week, now the full and final version is publicly available as iOS 11.0.3 GM (Gold Master) with Build # 15A432. As per some official internet sources, the recently leaked iOS 11 GM IPSW Files for iPhone, iPad, and iPod touch is the final version which Apple has revealed on 12th September 2017, Tuesday. So here we are also sharing the Official Direct Download Links of iOS 11.0.3 GM Final IPSW Files for manual installation using iTunes on supported iOS-devices. 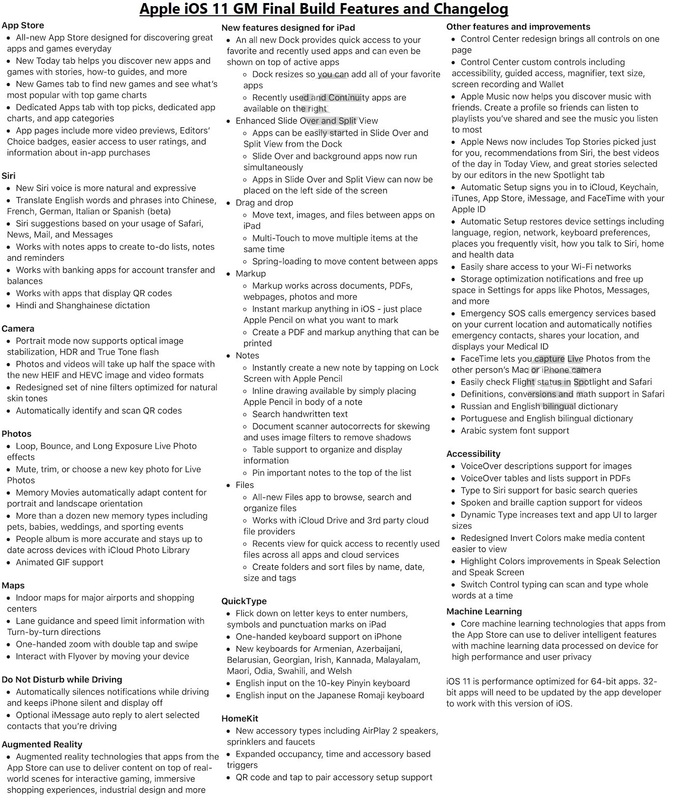 You can read the official iOS 11 Update Features and Changelog with a detailed list in an image attached below. You can also find iOS 11.x.x Beta features functions, and changes from HERE to get the closed know-how and difference between iOS 11 Beta.x.x Versions and iOS 11.x.x Final Versions. How to Install iOS 11 Manually via iTunes? Apple iDevice users can Free Download iOS 11 Firmware .IPSW Files via Direct Official Links available below to perform the manual clean offline installation using iTunes Software's by pressing "Shift Key + Update or Restore" button on Windows OR "Alt Key + Update or Restore" button on macOS. You can also navigate to Settings >> General >> Software Update option on your iPhone, iPad or iPod touch device settings to get instant iOS 11 OTA Update online directly from Apple's server. But before you move forward, always ensure to backup your device data via iCloud or iTunes. Moreover, Apple is now currently signing this iOS 11 GM Final Version. The latest iOS 11.0.3 Final Update (15A432) is now publicly available for iPhone X, iPhone 8 Plus, iPhone 8, iPhone 7 Plus, iPhone 7, iPhone SE, iPhone 6S Plus, iPhone 6S, iPhone 6 Plus, iPhone 6, iPhone 5S, iPad Pro, iPad Mini 4, iPad Mini 3, iPad Mini 2, iPad (2017), iPad Air 2, iPad Air, and iPod Touch (6th Gen) devices. The Apple watchOS 4.0.1 Final Update (15R654) for Apple Watch Editions and Apple tvOS 11 Final Update (15J381) for Apple TV 4 device is also available.